So our forum is undergoing a long overdue facelift… Up until this point, we’ve not been able to move onto updated software without losing all those years of useful content and posts. But it has meant that we’ve had to spend a big chunk of cash on doing it – please do DONATE HERE if you value the work that SVA puts into keeping you informed. <—- Anyway, whilst Dan was tearing his hair out on the amount of time it was taking to do the update due to the sheer number of messages and interactions, he came across an interesting figure. Genuinely, I have no idea what this figure is. We have 2,500 active members at the moment, but over the years it’s probably closer to 5,500 members as people enter/leave the industry. Not all of them will have posted on the forum (although we do encourage getting involved!! ), and some will have posted and chatted between themselves a lot – us VAs do love a natter! 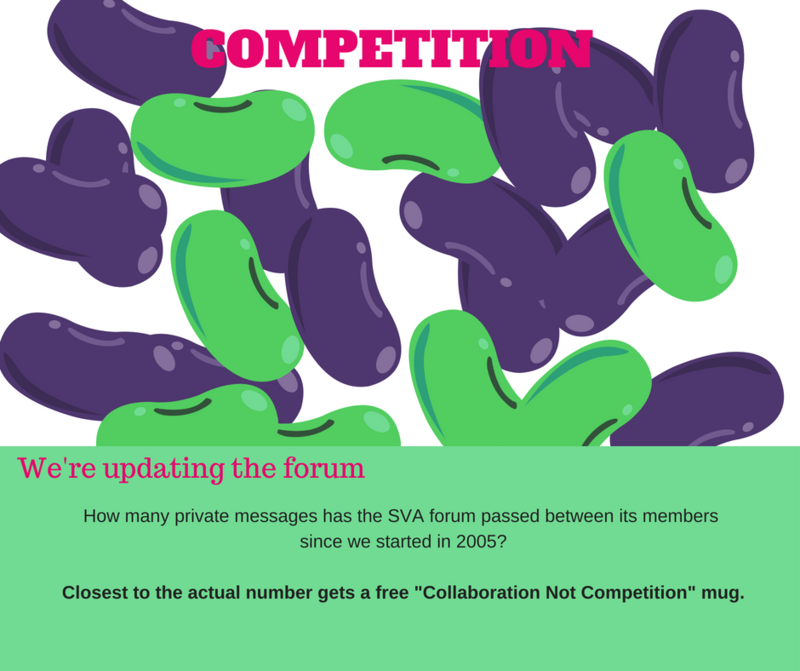 What is the total number of private messages passed on the SVA Forum since 2005? NB: This is my one – yours is still in its box!! We have a lovely “UK VA Collaboration Not Competition” mug up for grabs for the person who gets closest to the actual number of messages received. Dan has the final number, he’s the judge on this one, not me. No alternative prize, competition closes 1 July 2018. UPDATE: The actual number: 111,370 private messages sent! Congratulations to Louise Gilman – your lovely mug is on its way! Why have a forum instead of Facebook/Slack etc? Well, because it’s easier for people to search topics on a forum and that means we get less of the same questions being asked again and again. It also means that if Facebook suddenly change their algorithm or T&Cs, we don’t lose all our contact with you. There’s an element of SEO too – we want Google to see people regularly visiting the site and spending time on there. Nope – with a bit of luck, all your logins should magically just work on the new forum. (I say magic, what I actually mean is Dan painstakingly moving all the data onto the new platform and checking it all works). That’s all happening in the background, you don’t need to worry about it. Basically, you’ll log in and just see a shiny new forum and be able to log in with your usual username/password. Hopefully this will mean an end to delays setting up new members, less spam, a cleaner way of interacting. Just sent a donation on behalf of us all at Catch Your Calls to help with the forum costs as a thank you for providing such an excellent resource. Hi all, so happy to have won the competition, the postie has just delivered my lovely mug! 🙂 Thank you very much it is my new coffee mug for the office!